If a GL Account is going to be a true Summary Account, we can Disable Entry for the account. The values in the account going forward will only be a sum of the Child Accounts that are associated with the Parent (disabled) Account. For accounts that have Disable Entry enabled, the Account Name / Number will no longer show up in any Account Selector dropdowns in the system. The Account will be disabled for direct entry for all transactions (this includes importing Journal Entries that post directly to this Account). This is accomplished on the GL Account Record via a Check/Unchecked setting on the Account and can be changed as needed. The only values that would post (in a summary fashion) to this account would then be from the Child Account(s) that identified the Account in question as their respective Parent Account. 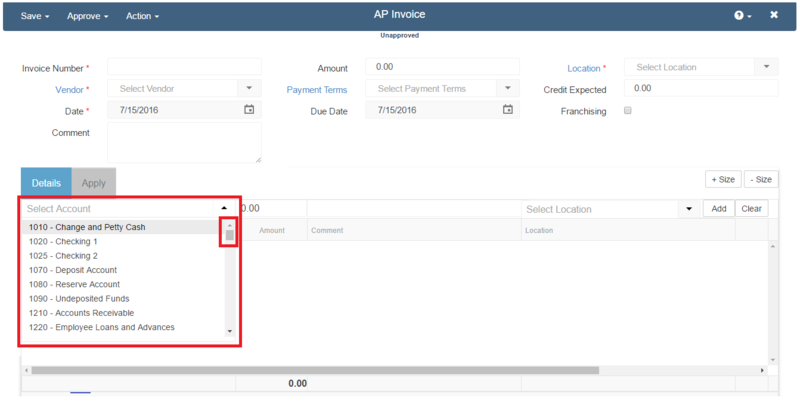 On an AP Invoice when the user selects the GL Account that will be used on the Transaction line item, Account #1000 is skipped over (#1010 is listed first) and does not appear in the Account Selector dropdown. The Disable Entry account will not appear in any selectors from Transactions throughout the system.